As you can tell by reading this blog, I love to try new products!! Who doesn’t? I am also very interested in new health products, like vitamins and other supplements. But I hate spending money on a full-size bottle of something just to find out that it doesn’t work for me or I hate the flavor, etc. Along comes Bulu Box. Bulu Box is a monthly subscription that provides you with samples of vitamin, supplement, health and weight loss products! You can choose from the regular Bulu Box or the Bulu Box Weight Loss. After you try the samples, you can review them on the Bulu Box website. You earn 10 points for every product you review and you can use your points to buy full-size products in the Bulu Box store. Here’s what the Bulu Box looked like before I opened it. I love all the positive messages on the outside. My favorite is “The Difference Between Try & Triumph Is A Little “Umph”. This is what was inside the box when I opened it up. Each box comes with a little brochure that gives a brief description of each of the products. The brochure in this box also had some good bodyweight exercises that can be performed anywhere, as well as a link to a free at-home workout book from fitness expert, Natalie Jill. Boo tried the Dream Water and the AeroShot. She said the Dream Water didn’t taste too bad and definitely helped her fall asleep,but that she had weird dreams. The Aeroshot, she said, had a “bearable but nasty” taste. The directions on the package were a little hard to figure out, but once we did, it worked fine. Boo said the energy boost was almost instantaneous, but tapered off gradually, which was nice. I tried the Qspeed CoQ10 and the AtEasePM. The QSpeed CoQ10 was in orange-flavored fast melt tabs which tasted really good. The At Ease PM is a standard capsule and it went down no problem. I can’t say how the CoQ10 worked, because it’s a supplement you take over time. The At Ease PM didn’t really work for me, but I was in a lot of pain that night, so that might have had something to do with it. My favorite part of this Bulu Box is the $50 iTrain gift card. iTrain is a website that has some downloadable exercise videos and hundreds of downloadable workouts for your mp3 player. I downloaded a few of the iStretch Yoga/Pilates combination workouts and they were great!! The music was calming and the instructor went at a really comfortable pace. They expect you to know some basic moves, but everything else is thoroughly explained. Other workouts available are iStretch Yoga, cardio, sculpt & strength, and iTeenTrain, which boxing and hiphop dance workouts. I can’t wait to try some of these as well. They all look fun!! You can get your own Bulu Box here. I got one box, but couldnt use most of the stuff included, but my husband really liked it. 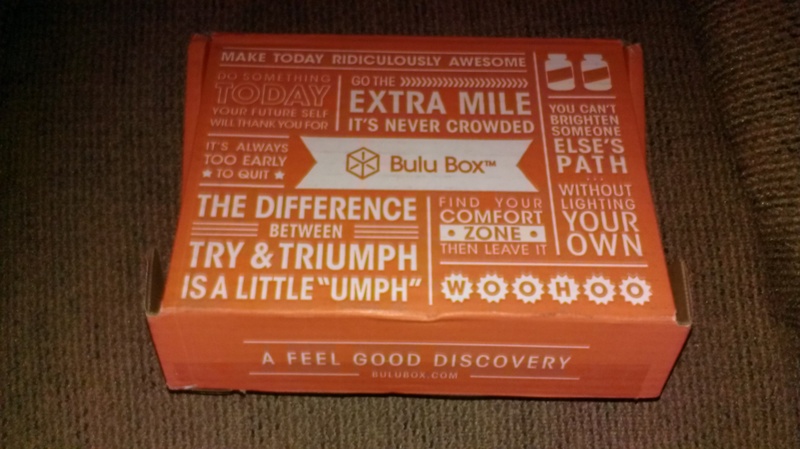 Bulu Box sounds like a great monthly subscription! I am very surprised to see that the cost of membership is extremely affordable. I may have to take a closer look at this membership – I love the idea of receiving new products every month. Thank you for sharing! This is so cool! I love trying out things like that but yes, hate it when I spend 30 bucks on it only to find out it’s gross or even has some sort of potentially dangerous ingredient! I love this idea! I’m always weary of trying new products, especially health related ones! This is perfect!